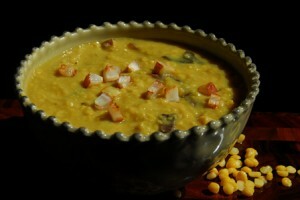 Wash the dal and boil with 4 cup of water. Mix in turmeric, cumin, garam masala, and slit green chillies. Mix in salt and sugar to taste. Mix well and stir fry till the time the dal is soft and thick. Heat up ghee in a kadhai. Mix in bay leaves and garam masala. When it stops spluttering mix in it to the dal. Cut the coconut into small dices and fry in ghee till light brown. Mix in this to the dal and stir. Serve hot along with luchi.